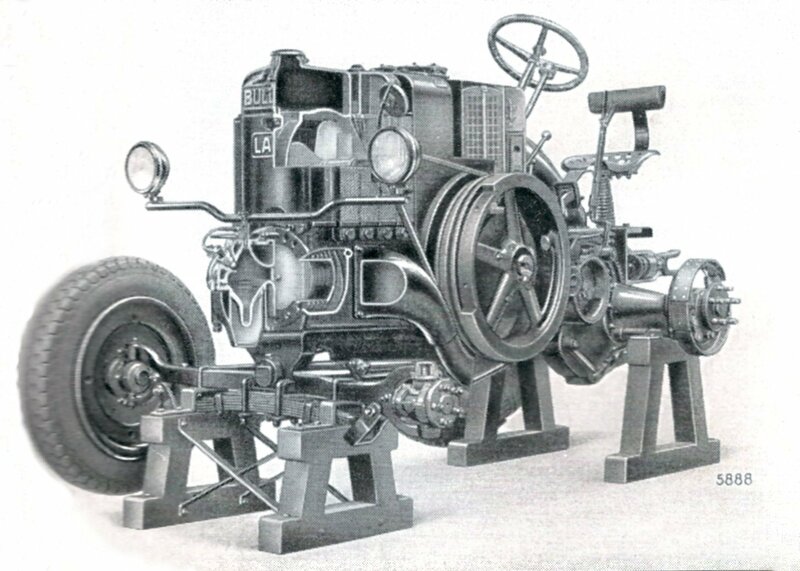 In the 21st century motor vehicles and farm machinery are highly technical computerised machines. A flat battery does not allow these futuristic rocket ships on wheels to be clutch started, kick started or crank handle started. Kaputski!!! A blown fuse can microwave all the inboard computer systems. 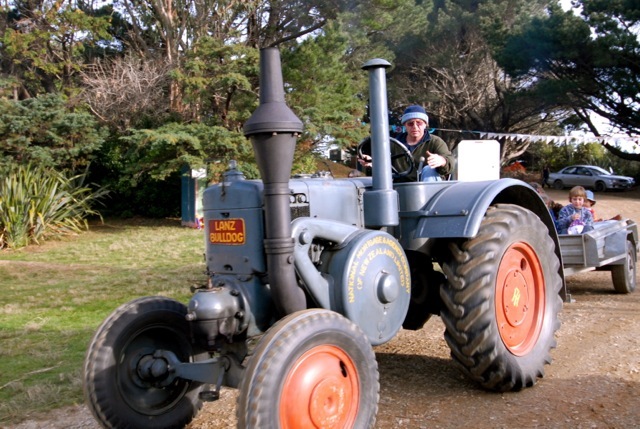 In sunny Karamea, Jack Simpson of Umere owns a veritable dinosaur. A 1938 LANZ Bulldog tractor. Built like a locomotive, the engine casing is solid cast iron evoking visions of German World War 1 tanks used during trench warfare. …and don’t the kiddies LOVE it! Initially the engine was a 6.3 litre 12 horsepower unit, but as the Bulldog evolved the engine was increased to 10.3 litres and 55 horsepower. While hot bulb engines were crude they were easy to maintain and could burn a wide variety of low grade fuels, even waste oils. 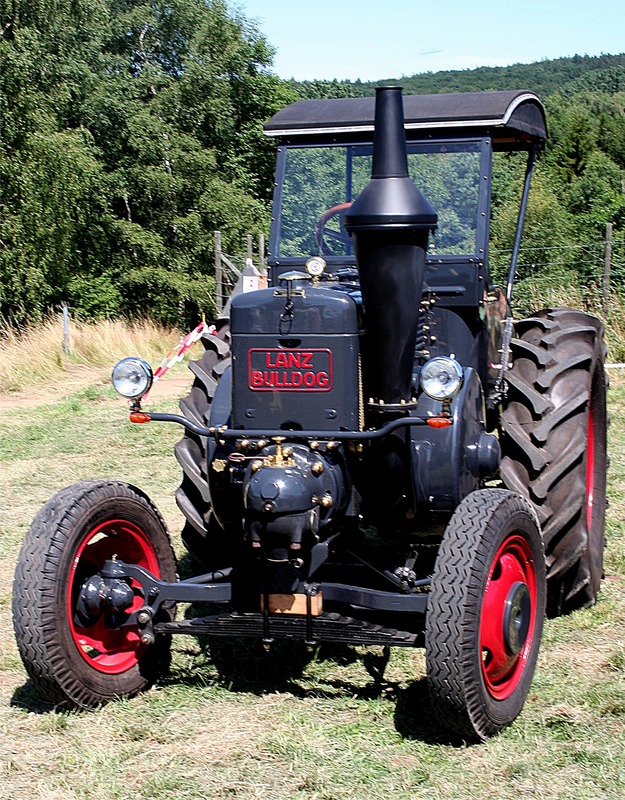 The Bulldog is similar to other European hot bulb tractors produced in a similar time frame, such as SF Vierzon in France, Landini in Italy and HSCS in Hungary. It is also similar to the Field Marshall produced in England except that the Field Marshall has a diesel engine and not a hot bulb engine. The Bulldog was also produced in France, Poland and Argentina. In Australia the KL Bulldog was produced by Kelly and Lewis of Springvale, Victoria, Australia from 1948 to December 1952. Just over 860 were built, based on the 35 horse power model N Bulldog. Listening to the slow methodical beat of the single cylinder piston at rotating at 600 rpm transports one back to a simpler time when the All Blacks were paid 2/-6 and a meat pie, smoko lasted all day and porridge was a luxury! 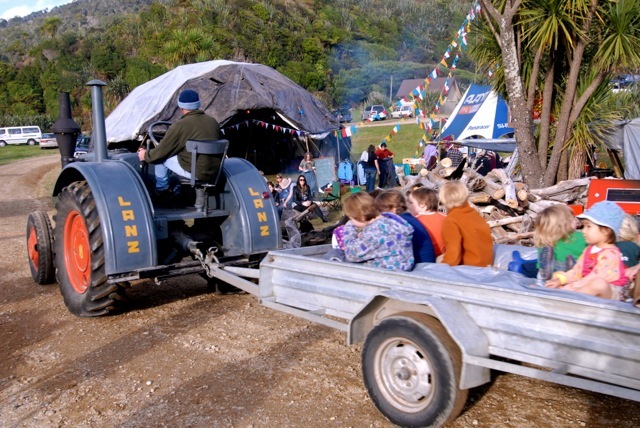 This entry was posted in Agriculture, Business, Education, Historical, Humor, Humour, Karamea, LivinginPeace Project, New Zealand, Photography, West Coast and tagged History, karamea, LANZ Bulldog, Machinery, Tractor. Bookmark the permalink. An incredible example of precision German engineering, techologically advanced for the 1920’s that one can only really appreciate by seeing this mechanical monolith in action. DJ Pukeko Radio Karamea 107.5 FM! Heyy there! Do yoou usse Twitter? I’d liike too follow you if tthat would be okay. All posts for The Rongolian Star are tweeted…thanks for your interest in what I do, glad you like it!